LS Cable buys 3 million meters of superconducting wire from American Superconductor. Will the superconducting market really change smart grids? Korea’s LS Cable purchased three million meters of wire from American Superconductor. It’s the world’s largest order to date. The wire is AMSC’s second-generation, high-temperature superconductor wire, called Amerpium wire. LS Cable wants to supply the cables for electric utilities around the world for alternating current (AC) and direct current (DC) technology. The company is already in talks with Korea Electric Power Company (KEPCO) and wants to penetrate the U.S. and European markets next. AMSC will ship the cables to LS in 2012, just in time to be used in a smart grid demonstration project set to be completed by 2013. “The Korean market is one of the most progressive in the world in terms of the smart grid roll-out,” said AMSC’s Jason Fredette, managing director of corporate communications. Korea wants to be the first country to do the full switch from the traditional electric system over to smart grids. The superconducting wire is already being built into Korea’s grid near Seoul, which will be charged later this year. Historically, AMSC has been the main leader in the market. It sells 80 percent of the wire that is used worldwide. 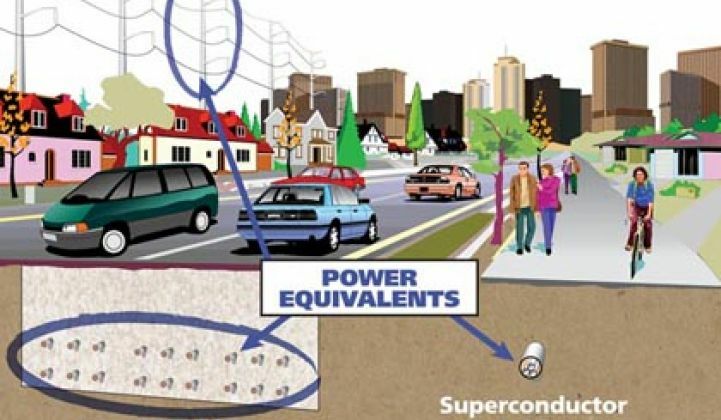 To put the Korean order in perspective, there is a superconductor cable that has been running in Long Island (controlled by the Long Island Power Authority) that is only half a mile long. Up until now, that was considered big. However, with the three million meters of cable LC Cable purchased, the Korean company will have enough wire to install 10 to 15 miles of cable. So what’s all this buzz about superconducting wires? Here’s a quick introductory lesson: a superconductor is a perfect conductor of electricity because there is no resistance. One superconductor wire can carry over 100 times as much electricity as copper, which is the metal that makes up our traditional power lines. A cable system can power 300,000 homes and can transmit about 574 megawatts of electricity at full capacity. The cables are generally put underground and are not dangling above the ground like power lines traditionally do. Some other advantages of using superconducting cables is that you can connect substations together without having to build new substations. It also leaves the grid better prepared for natural disasters by setting up a self-healing grid system. Superconductors are the optical fibers of power, Fredette said. “It’s similar to the revolution that fiber optics caused in the telecommunications industry. We are expecting superconductors to do the same for the power industry,” he said. Here in America, superconducting cables will also be used in the Tres Amigas SuperStation in New Mexico. For instance, without superconducting cables, it would be hard to transmit wind power from Texas to California during peak demand. The three grids come close to each other, but they aren't connected. This prevents electricity from being transferred between the three regions. In that sense, it's like the nation's fragmented roads in the 1950s, before the Interstate Highway System linked the country. Tres Amigas hopefully will fix that problem and connect the fragmented grids together. The SubStation will use high voltage direct current (HVDC) superconductor cables that can transfer bulk power at gigawatt levels with 100 percent efficiency. Also, superconducting cables transfer power at higher densities. By the looks of it, much of that money will go into making the smart grid more efficient. Korea’s emerging smart grid is definitely one to watch.